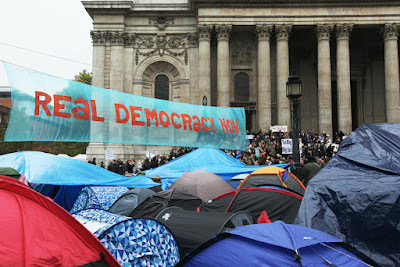 Home » europe » Photos: 2nd month of Occupy in London and the U.S. 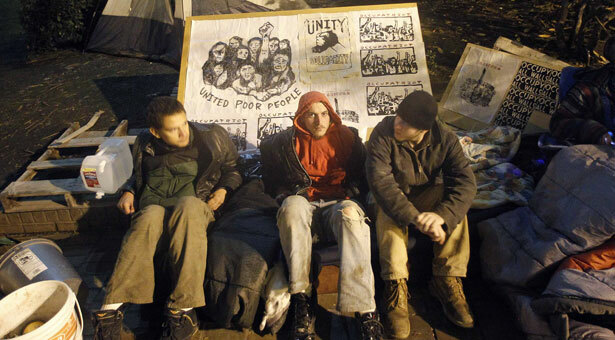 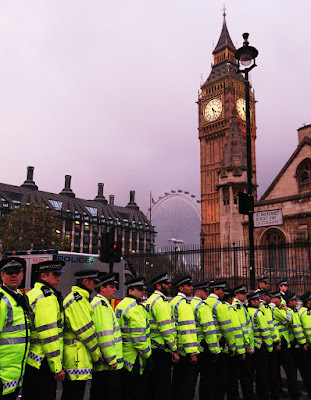 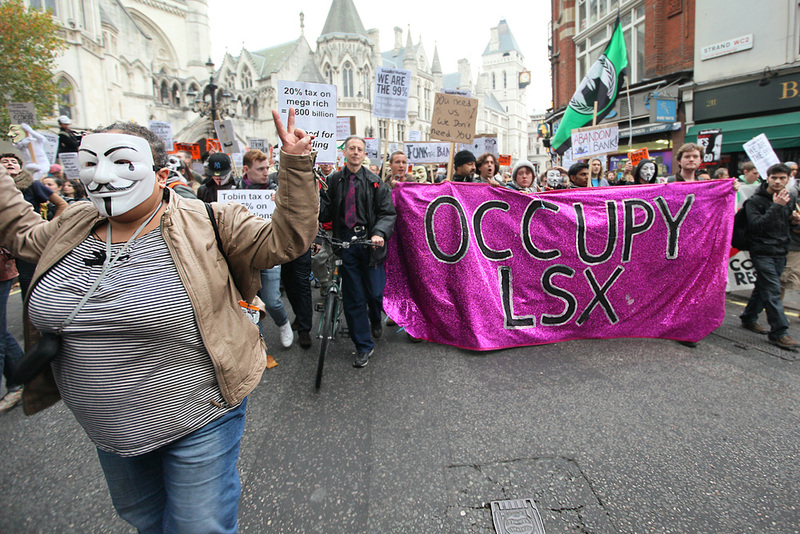 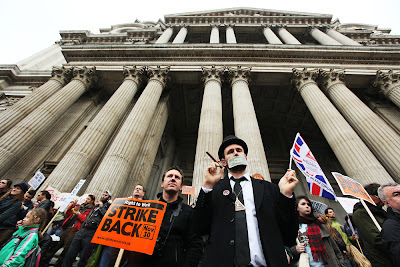 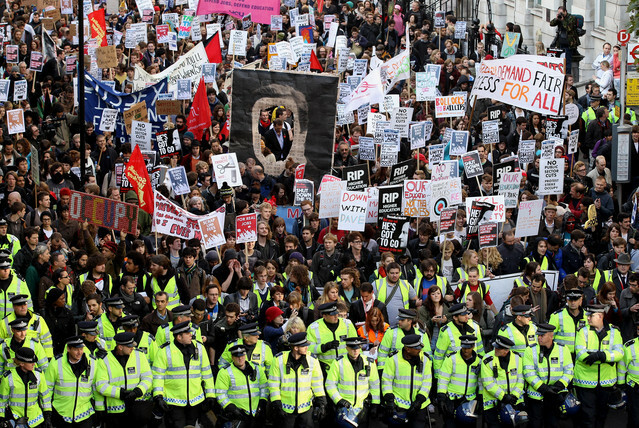 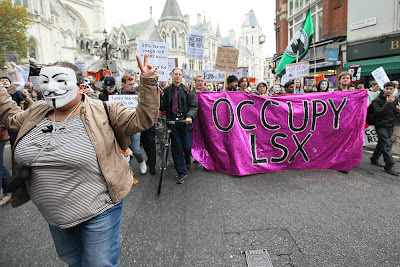 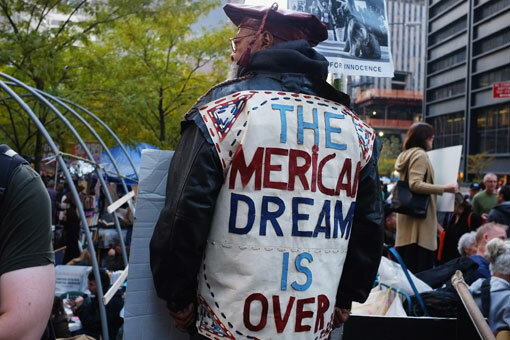 Photos: 2nd month of Occupy in London and the U.S. 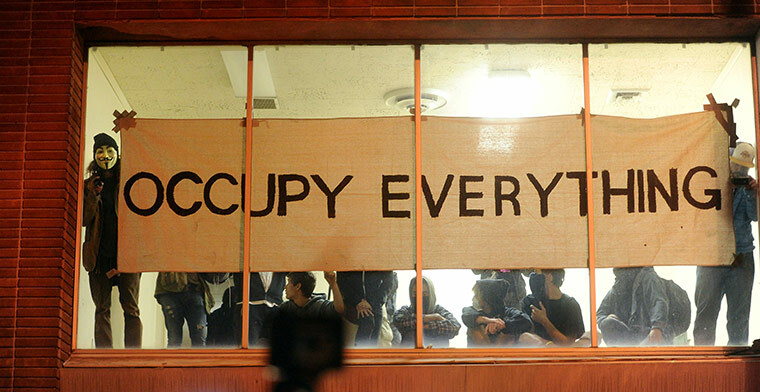 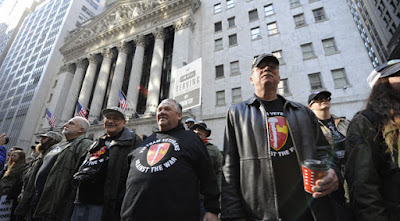 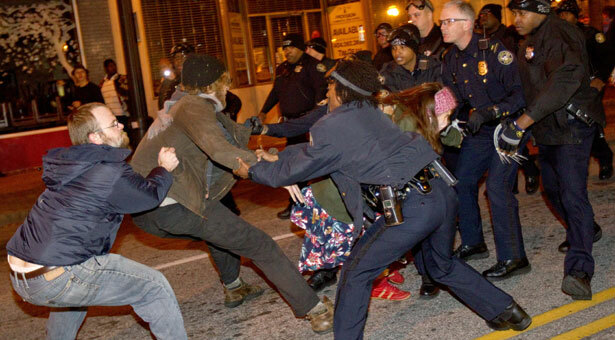 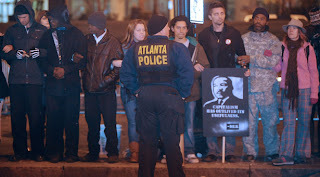 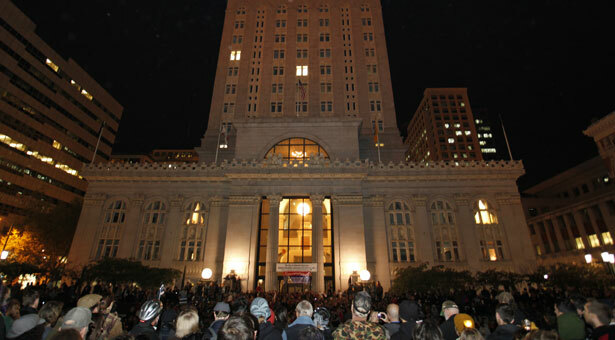 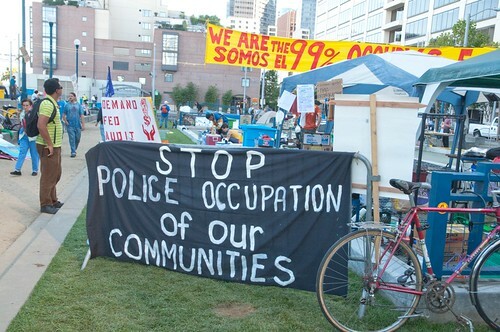 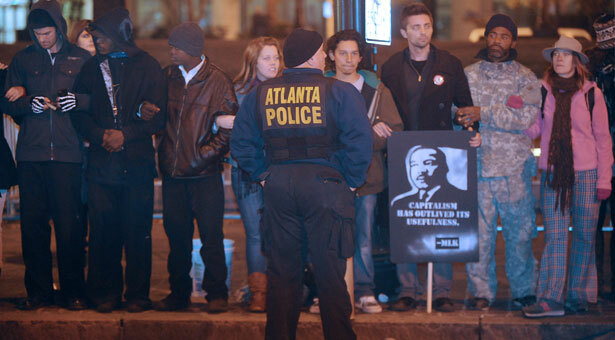 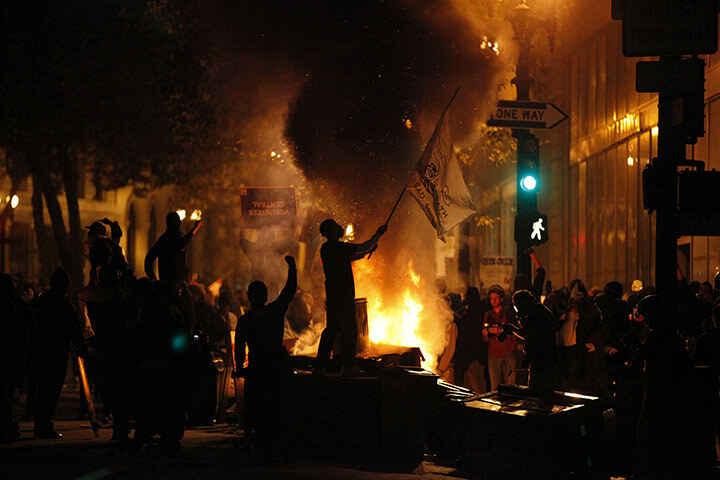 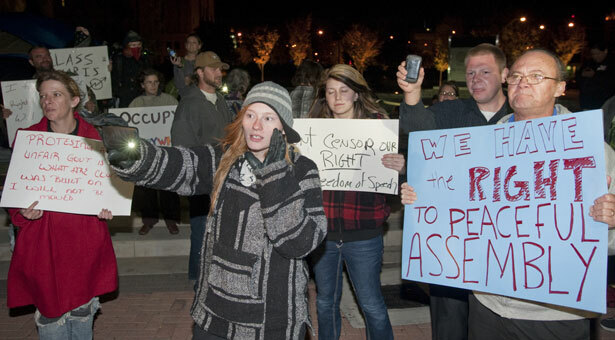 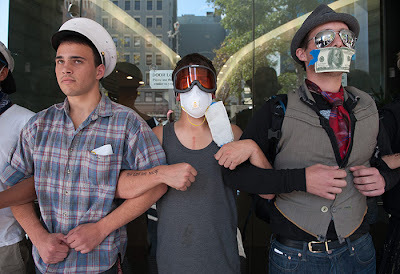 Occupy Movement worldwide has entered into the second month as on November 8, 2011. 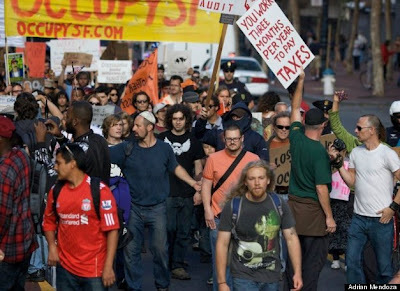 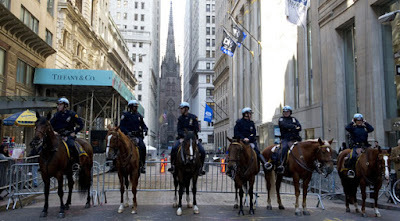 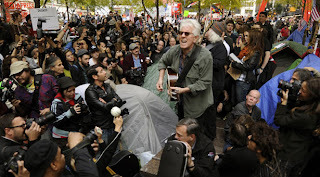 Occupy Wall Street protest was started on September 17, 2011 and began to gain media and worldwide attention. 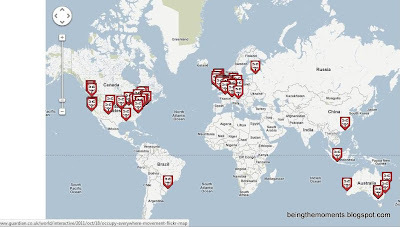 By October 9, 2011 Occupy protests had taken place in over 95 cities across 82 countries and over 600 communities in the United States. 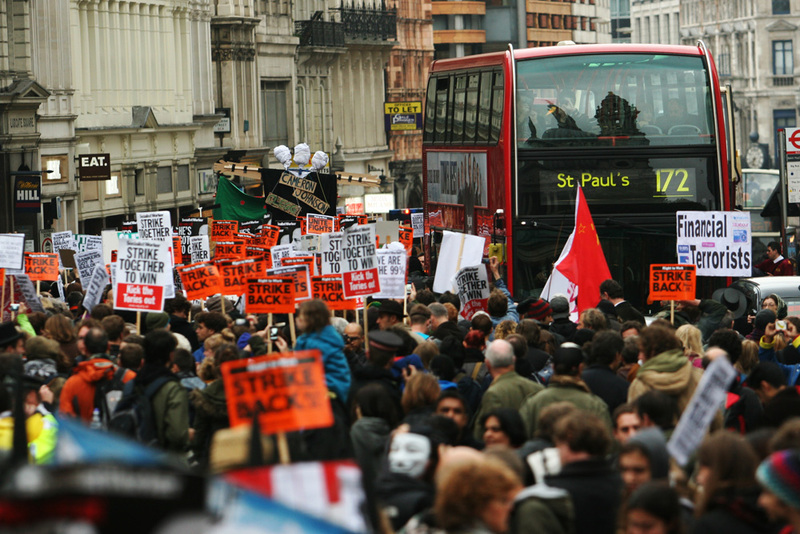 According to the news report by Aljazeera English, a mass rally took place on November 5, the 407th anniversary of Guy Fawkes' attempt to blow up the Houses of Parliament - a plot led by Catholic religious extremists intended to strike back against lawmakers who were endorsing the persecution of their religious minority - attracted thousands of protesters. 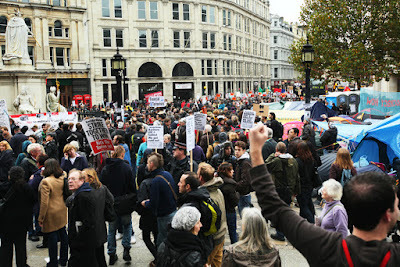 (Updated) Based on today's news, Bloomberg on November 9, 2011, U.K. students protest in London's city against the education budget cut and rising tuition fees. 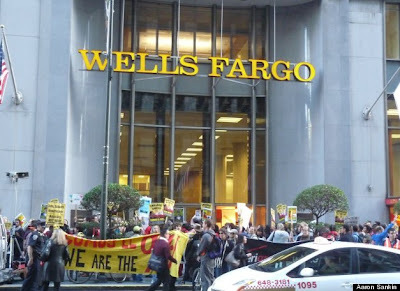 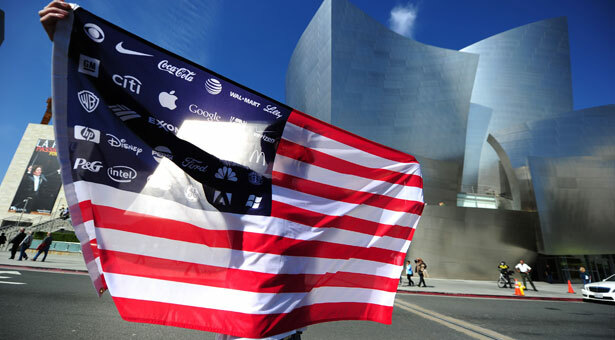 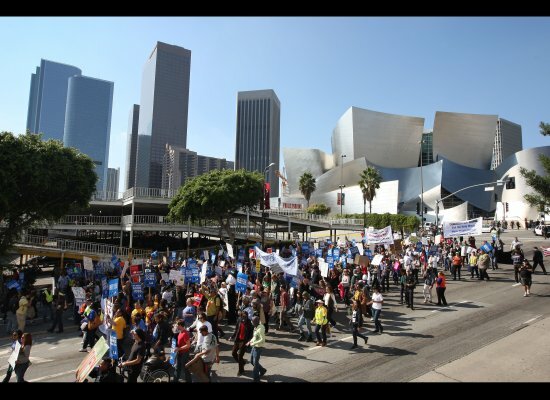 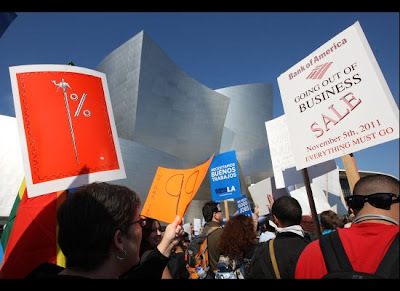 On the other side, Huffingtonpost reported that hundreds of people marched through Los Angeles's financial district on November 5, 2011 to take part in "Bank Transfer Day." 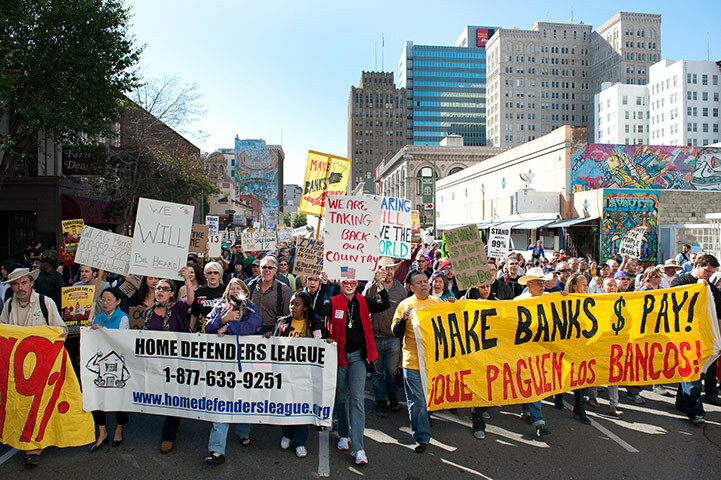 Bank Transfer Day was started by Kristen Christian, a 27-year-old gallery owner from Los Angeles. 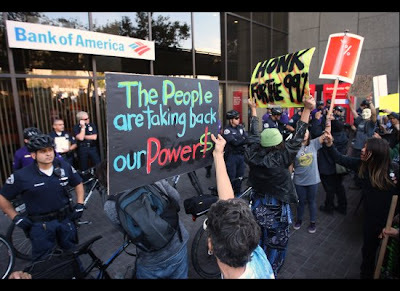 She had sparked a national conversation when she posted this on her personal Facebook profile: "If you don't want to pay the likes of Bank of America $5 a month to access your money via debit card, just transfer your cash to your friendly, local credit union." 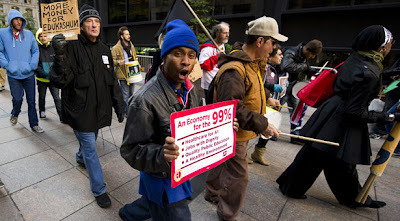 The demonstrators from the worldwide voice out their frustration and protest against the corporate greed, leaving hundreds of thousands unemployed, facing homeless and suffer with heavy debts which drive them to become from poor to poorer while the rich gets richer. 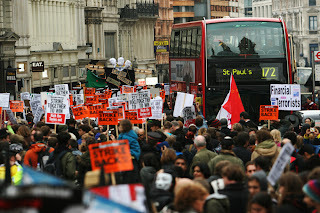 Now, let's look at some pictures during the protests demonstration in London, UK, California (San Francisco, Oakland and Los Angeles) and New York on November 5, 2011. 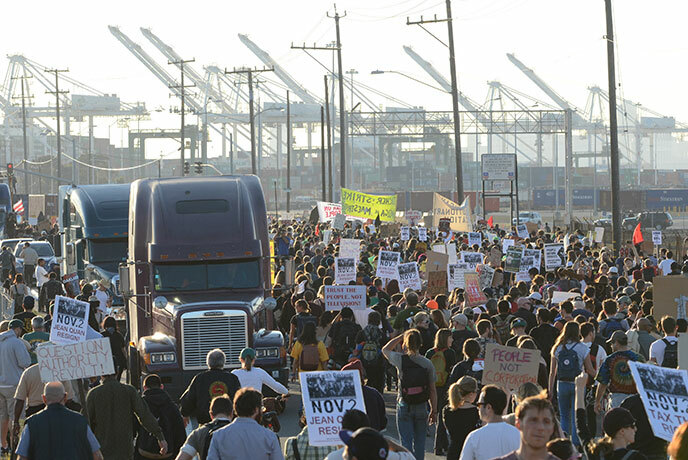 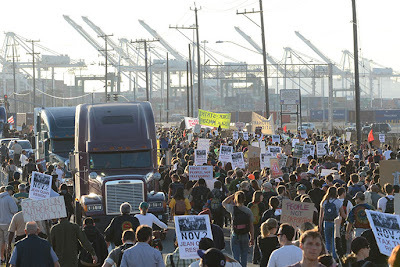 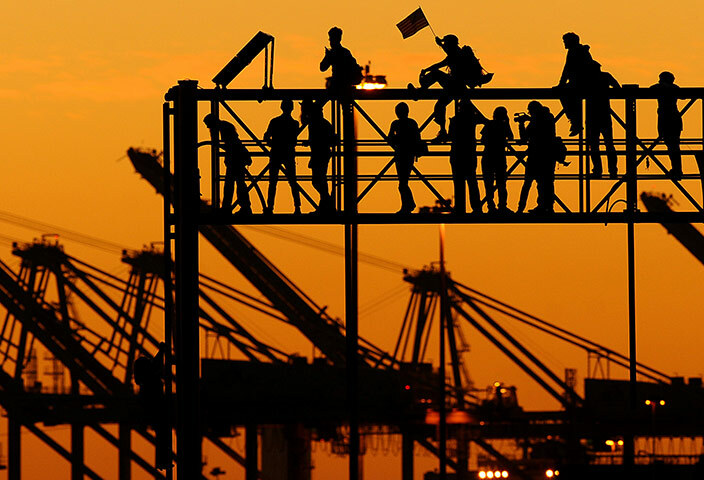 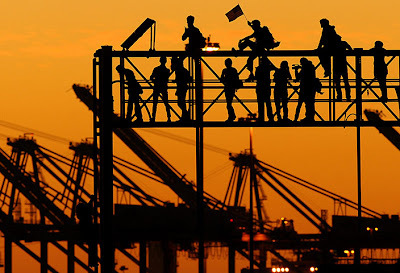 Protestors climb on a truck at the Port of Oakland during Occupy Oakland's general strike. 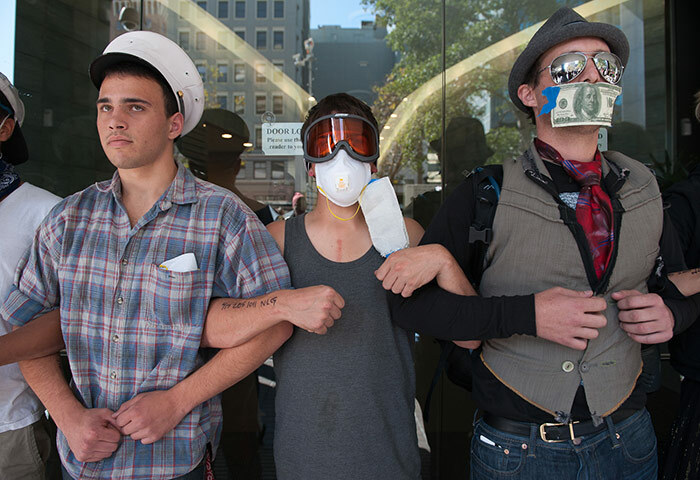 An Occupy Los Angeles protester marches through the financial district during a Bank Transfer Day demonstration. 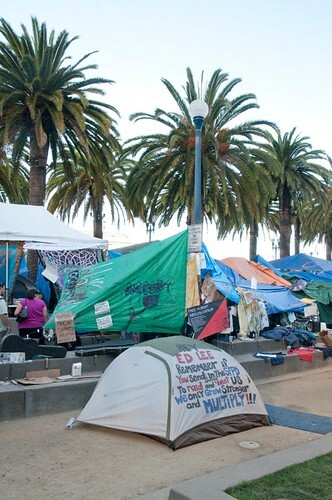 camping area even though it's snowing in New York. 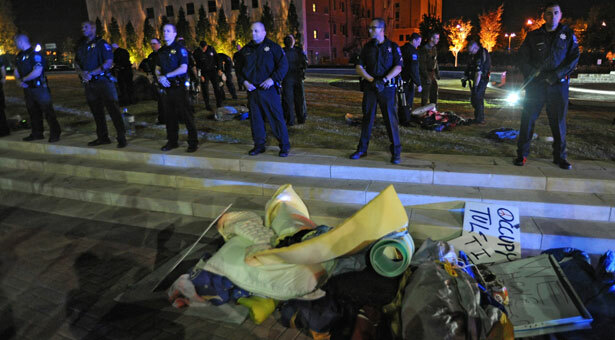 Police officers form a perimeter around Centennial Green in downtown Tulsa. According to the latest news, USA Today, Occupy Wall Street is going on the road — a two-week walk from New York to Washington. A small group of activists plans to leave Manhattan's Zuccotti Park at noon Wednesday and arrive by the November 23, 2011 deadline for a congressional committee to decide whether to keep President Barack Obama's extension of Bush-era tax cuts. 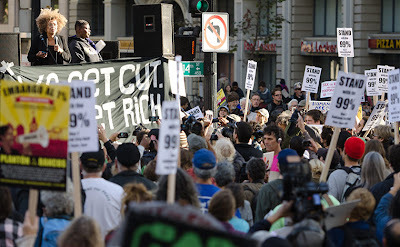 Protesters say the cuts benefit only rich Americans. Now, we have to wait and observe as how long this occupy protest will last. 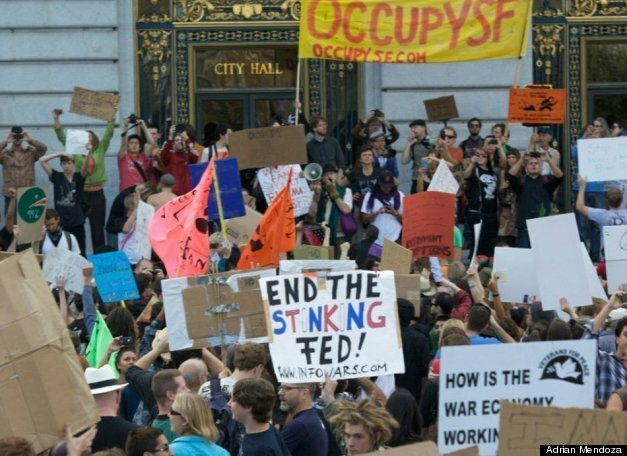 Will the U.S. government make amendments to the needs and demands from the people? 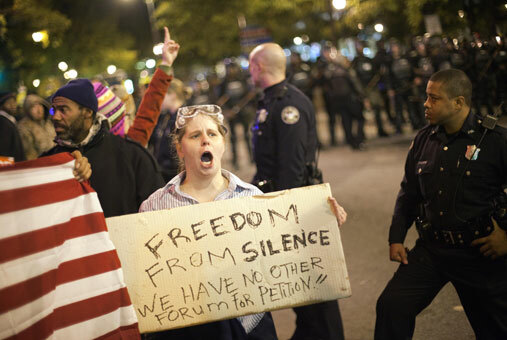 If the occupy demonstration keeps going on by occupying the parks and marching at the downtown of San Francisco, New York, Portland, Chicago or other parts of the world, it will leave ugly impression and chase the people and tourists away from traveling to the cities and countries. 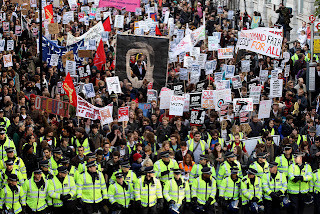 As such, I believe many businesses which rely on tourism and international trade, will be affected badly and crimes like, looting and vandalism, will be rising too due to this occupy protest. 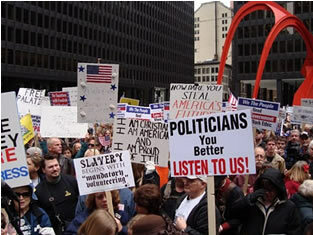 S. Koreans protest against the U.S.